This tutorial briefs you on how to use the Hosted VICIdial Demo. It will make most sense to someone who has some experience operating a predictive / auto dialer. Phones login: 10 phone accounts are already created. Phone logins are from e701 to e710 and passwords same as phone login. 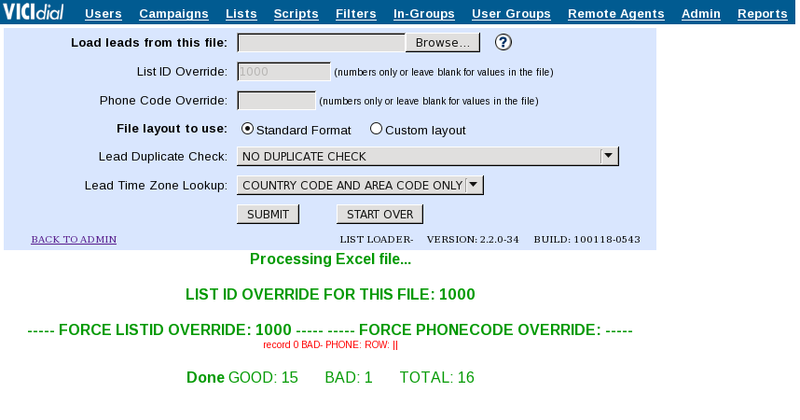 The phone account e701 is configured with a phone number which was provided while registering for VICIdial demo. So when agent logs into the VICIdial server using phone account e701, the configured phone number will receive an incoming call from the server and the agent gets connected to the VICIdial session. Agents login: 10 agent accounts are already created. Agent logins are from 7771 to 7710 and the passwords same as the agent login. Campaign: A default campaign "Campaign 01" is already created. The campaign is set to manual dialing. 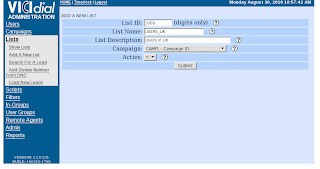 Lists: A default list "LIST 01" is already created and is assigned to "Campaign 01". A set of sample leads file is already uploaded into list "LIST 01", so that you can start testing the demo rightaway without you having to create new lists and uploading leads into it. 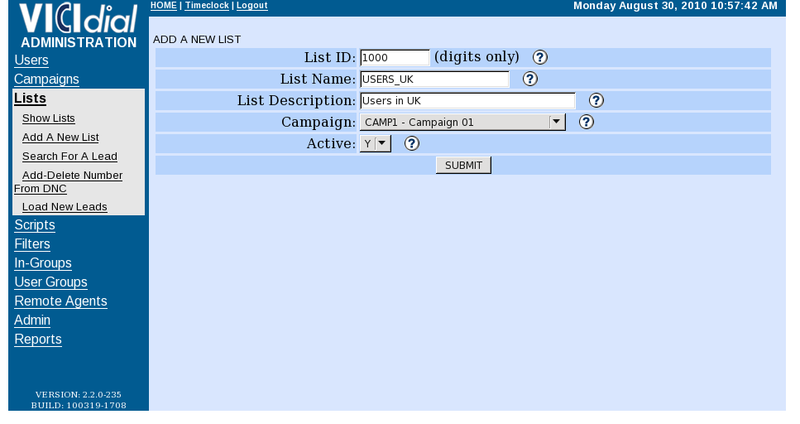 Steps to create lists and uploading leads into the campaign is explained later in thsi tutorial. If you are testing out the demo hosted dialer then you can skip this section and move on to "Start operating the Hosted dialer" section. When you register for the demo, you are asked a phone number, the same number is configured in one of the phone account e701. Steps to configure the rest of the phones is explained below in snapshots. For configuring Phone account, Login as administrator, click on "Admin" section, click on "Phones" and select the phone to configure. below image displays the list of the phones. 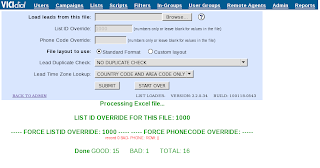 Lets see how to configure phone account e702 with the phone number "1200000011". 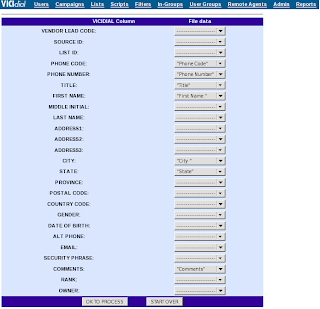 After the configuring the phone account, when the agent logs into VICIdial web console using this phone account, the phone number mentioned will get an incoming call from the VICIdial server connecting him to the VICIdial session. To configure phone account e702, click on e702 to view its details. Edit the dialplan number and add the phone number(along with ISD code) "1200000011" to "1555". Such that the resultant dialplan number must be "15551200000011". Keep rest of the settings to its default values. Please note that "1555" is the dialplan prefix. Once the dialplan prefix is edited, click on submit button, and the phone e702 is configured. Click on submit and the list is created. Clicking on submit button opens up a new page, select matching VICIdial columns against your lead file columns and click on 'ok to process'. After submitting, it displays a message about the status of your leads.In ideal case it should display a message as GOOD: n-1 BAD: 1 and TOTAL: n where n is the no of entries in your leads file. The GOOD and BAD entries depends upon the quality of your leads file. If quality of the leads file is good and you have followed the above mentioned procedure, leads will be uploaded into the campaign after one minute. Phone login e701 and password e701. In your browser, enter the URL of your VICIdial server. click on Agent login. 3. Enter web interface phone login name and password. 4. Enter Agent-id and password and select campaign to log into. 5. After submitting you would be redirected to VICIdial console and you will receive an incoming call from the VICIdial server connecting you to the session. If your campaign is set to manual dialing then click on 'DIAL NEXT NUMBER' to start dialing from the leads or click on 'RESUME' if campaigns dial method is set to ratio. 6. To finish a call, click on 'HANGUP CUSTOMER'. It will redirect you to disposition page, there you can enter the outcome of the call and click on submit. The demo above has a daily limit, after which the server will automatically shut down. However, your account will automatically be credited with demo credit after a few days, when you can resume your experimentation. Signing up after the demo is also easy. Start depositing money into your prepay account, details of which are sent in the email when you register for the demo. You do not have to use WarmConnect minutes in production. The first payment must be of USD200 made by wire transfer, after which you can switch to credit cards and PayPal. On payment the demo server above will automatically be converted to production.